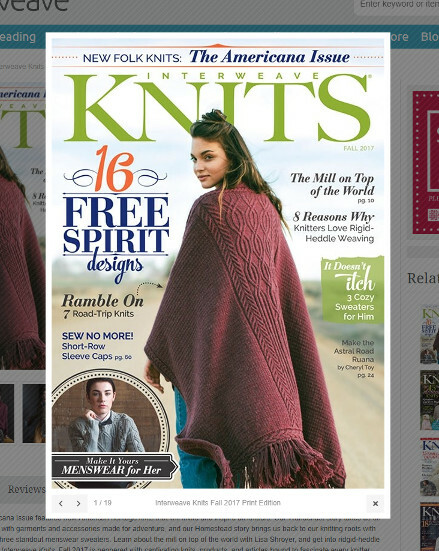 I used to have an Interweave Knits subscription for a while. There were however so many other publications that interested me more. But then I saw the cover of this issue. And I checked out some of the images on the Interweave website. And I knew I had to pick this one up again. There were simply too many beautiful projects right up my alley in the Interweave Knits Fall 2017 issue. The theme for this issue is “Americana”. They mean it in a way that the designs remind them of, or were inspired by things that are quintessentially American. Now I’m obviously not American and haven’t spent enough time in the States to give an opinion on that. What I can tell you is what I loved about this issue and which projects ultimately made me buy it. There are 16 projects in this issue, separated into two stories. All together you’ll find 8 cabled projects, 4 sporting mostly textured designed, 2 stunning fair isle pieces, 1 lace shawl, and 1 brioche hat. The first story – Wanderlust – has seven projects in total, five of those with a cable design. The second story is Homestead and includes a lot of elegant textured designs and three men’s pullovers. My favorite design in this issue is All Tangled Up in Gray. It’s a beautiful yet simple cabled turtleneck pullover and definitely I something I’ll have to knit soon. I want to wear it and for me, it’s a lovely everyday kind of sweater. 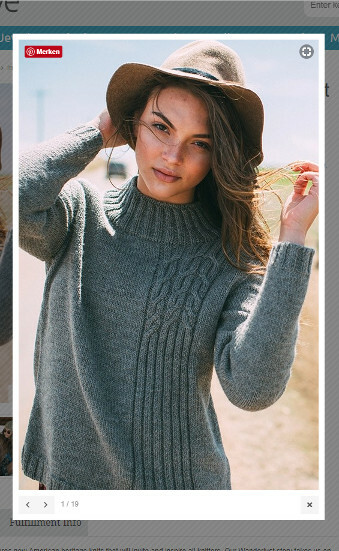 I would also love to knit the Free Falling pullover with its interesting diagonal cable motif. But I would likely have to make it longer and change the shaping some to suit me and make it comfortable for me to wear. The two color brioche Whitman Hat has also made it onto my must-knit-list. After having knit my first brioche project earlier this year, I’d like to knit more. I would just have to make this hat slouchy. Close fitting hats make my head look even larger than it already is. Astral Road Ruana is the cover piece of this issue and with good reason. It’s beautiful and stands out. And the cable motif is really pretty. My only problem with this piece is that I wouldn’t be able to wear it. It’s too impractical and not really a piece you’d wear to go grocery shopping or to the playground with. I would, however, be tempted to use the cable motif on a sweater. The issue starts off with a stunning stranded cowl. The All Who Wander Cowl reminds me of ethno fashion (not that I would know a lot about fashion) and uses motifs inspired by 18th-century American embroidery and the National Museum of American History. Also, geeks (like me) will love this. The cowl incorporates a quote by Tolkien for which it has been named: “Not all those who wander are lost.” This cowl has not made it into my queue for one single reason. It is too wide and too far from the neck and likely not stretchy enough that I could wrap it around my neck twice. It wouldn’t keep my neck warm enough in fall and winter (we get very cold winds here) and therefore, I would never wear it. 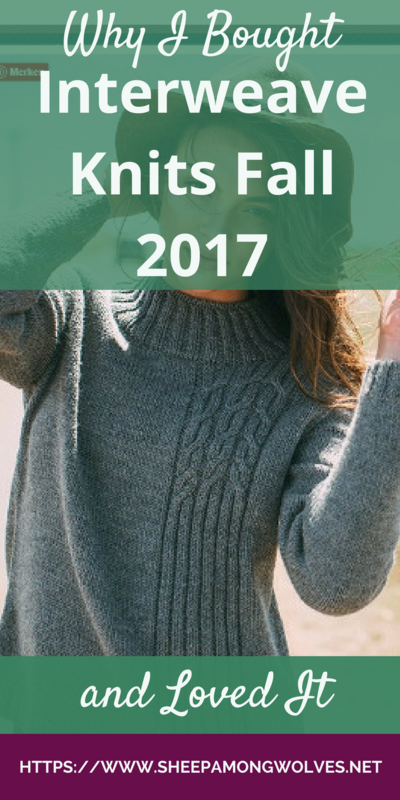 The Highway 61 Pullover and Goldsmobile Top are both pretty cabled projects and wonderful designs. But where the first has too many voluminous cables, the second is made of way too bulky yarn to suit my taste and figure. Both look good on slim figures, though. 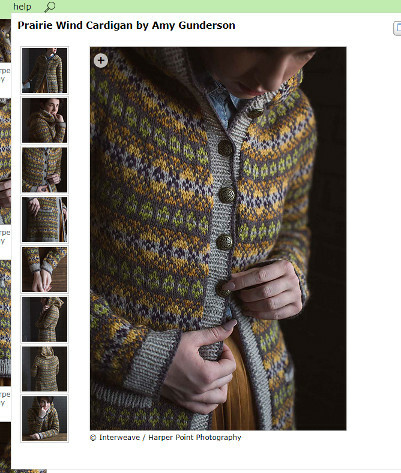 The Prairie Wind Cardigan is just beautiful. It’s fair isle, comes with a hood (for some reason I love hoods though I rarely wear them up) and it’s nicely long and just great for fall. The two colored cuffs and button bands are just pretty and I can’t wait to play with colors to find a palette that suits me. Now that I’ve cut my first steek I know I can knit projects like this and know they are fun! Plus, I can totally see me wearing this on the playground. 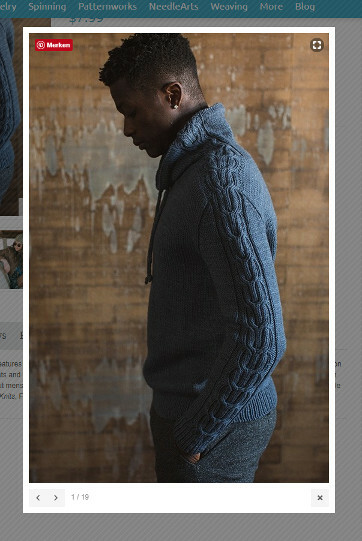 The Nelson Pullover is actually a men’s sweater though I’d wear it too. I love the cowl neck and the cables running up the sleeves. I don’t know if Papa Wolf would wear this sweater (not sure if he likes cowl necks, he doesn’t have any) but if not then I’ll just make one for myself. Hank’s Pullover is another nice men’s sweater. This one is more elegant in design. I especially love the welted shawl collar and garter rib stitch on the body. I am reasonably sure Papa Wolf would indeed wear this, so I’ll likely knit this one. The Subterraneans Cardigan actually reminds me more of British school uniforms than America. It’s covered in an argyle motif made with traveling stitches and has a deep V-neck. I liked this design the least. I found it just too reserved and kind of boring. That may also partially be due to the photography and styling but it just didn’t hold my interest. It’s a shame because usually, I love Anne Hanson’s designs; my wedding shawl was also one of her designs. Whiskey Creek is another nice sweater for men. It’s simple and elegant with the reverse stockinette panel on the chest and shoulders. And has a nice garter stitch shawl collar. I am sure there would be a lot of men who look good in this but I wouldn’t Papa Wolf to wear it. I fear it would make him look old. Again that might just be the photos. The Angelina Pullover has a pretty yoke but it seemed too large and boxy on the rather thin model. I can’t really tell if the shape of the sweater is nice or not, it just doesn’t seem to have shape. A really beautiful piece with a complex cable design is the Cash Pullover. It comes with saddle shoulders (I’ve been meaning to try a sweater with those for a while). But I think it may just have too much going on to look good on me. On the model, it’s really pretty, though. The Gold Rush Shawl is a nice lace shawl for fall. It’s not too lacy and will still keep you warm but still looks feminine and stylish. And finally, we have the Madame George Pullover. A feminine, textured raglan sweater with a folded-over turtleneck. It’s nice and seems very comfortable. I personally don’t like to wear folded-over turtlenecks as much. They are always too warm to wear when inside and too bulky around the neck if you add a scarf or shawl for outside. I think styling and photography didn’t turn out as well with the Homestead story. Especially when in direct comparison to the Wanderlust story. The photos seem colorless, cold and boring whereas the Wanderlust photos seem warm, comfortable and dynamic. I believe they likely wanted to create a contrast to separate the two storylines but I just don’t think it turned out well. That might also be the reason why I either liked the Homestead designs or found them not interesting enough, too reserved or even somewhat old-fashioned. I didn’t have that kind of reaction to any of the Wanderlust designs. All in all, I really enjoyed the designs, however. I found a lot more designs I liked or that I would knit than in past issues. And it made me want to cast on for one project or another right away which also hasn’t happened in a while. 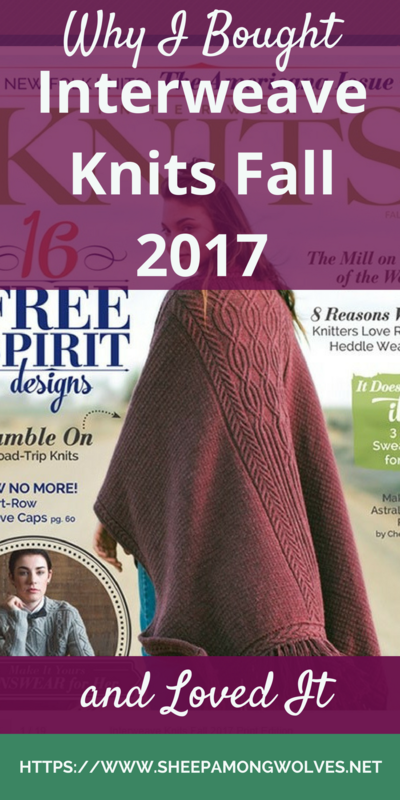 How did you like the Interweave Knits Fall 2017 issue? Are you going to pick it up or is it not for you? What do you think of this issue compared to previous issues? Please let me know in the comments below. As you can see by this post coming to you a bit late life has become a little hectic in the wolf den. Papa Wolf is not feeling well. Our babysitters (aka grandparents) won’t be available for a while. My free afternoon has evaporated and it’s kind of hard to write with a 2-year-old on your lap demanding to watch Elsa sing (yes, that Elsa) and a 4-year-old doing what they do best (creating chaos, mostly). It’s funny how much difference just one free afternoon a week makes. But I’m still planning to get out one post a week at least. So I hope to see you soon on this very blog! The dark sweaters on a dark background did not work for me. I was disappointed. But that Ruana….ooooh I love it!